When high winds are expected, the National Weather Service will issue a wind advisory or high wind warning. Spring storms typically bring memorable gusts to the Bluegrass, but Lexington has seen strong, damaging straight-line winds in all seasons. High winds can topple trees, snap utility lines, overturn vehicles, and turn debris and unsecured belongings into dangerous projectiles. Wind Advisory Expect sustained winds of 25 to 39 mph and/or gusts to 57 mph. Downed tree limbs and local power outages are likely. High Wind Warning Expect sustained winds of 40 mph or greater, or gusts of 58 mph or greater. Widespread power outages and many downed limbs or whole trees are likely. Structural damage may occur. Bring belongings inside. Depending on an item’s weight and the wind’s speed, any unsecured object can be damaged or destroyed. Worse, if it takes flight, it can endanger people and property downwind. When the National Weather Service issues a wind advisory or high wind warning, move patio furniture, outdoor grills, toys, trash receptacles, and similar household items to a safe location. Also ensure construction materials, such as plywood, sheet metal, or shingles, aren’t in a position to blow away. Keep up with yard work. 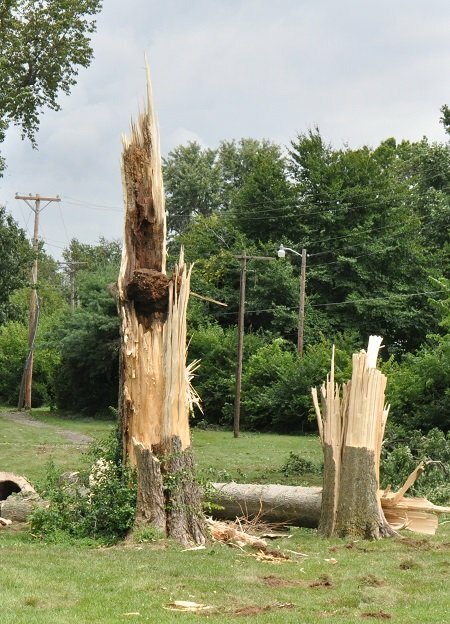 Tree limbs that have been weakened by disease, age, or previous weather can come down in high winds – as can entire trees. Falling limbs can cause traffic accidents, damage buildings, and injure or kill anyone standing under them. The risk increases after a harsh winter during which snow or ice accumulations may have stressed many trees. If you can safely prune your own trees, do so each year. If you have any doubts, consult a licensed arborist. Keep up with home repairs. Just as strong wind can snap damaged tree limbs, it can carry away any loose home fixtures such as roofing material, outdoor lights, gutters, or shutters. Make sure anything attached to your house is attached securely. If you’re outdoors when high winds strike, take cover indoors, under a secure shelter, or next to a building. Avoid temporary structures and buildings under construction. They’re more likely to collapse in high winds. Watch out for falling or flying debris, including tree limbs, street signs, and construction materials. Drive at an appropriate speed and allow more time to reach your destination. Even if your vehicle and skills are up to the weather’s challenge, other drivers may not be so fortunate. Take extra care if you’re in a high-profile vehicle. SUVs, vans, trucks, and trailers have more side surface area, making them harder to steer and more susceptible to being pushed or rolled by the wind. Maintain a safe distance from other vehicles in case the wind pushes them into your lane – or they have to brake to avoid debris. If the winds are too strong for safe driving, pull over and stop, making sure you’re well away from anything that can fall on your vehicle. Avoid downed power lines and anything that may be touching them. You don’t have a safe way to determine which lines are unpowered and which are live. Notify the local utility company or call 9-1-1 to report them. If a line falls on your vehicle, stay inside. Don’t touch any part of the vehicle’s metal frame. Call 9-1-1. Roll down the window and warn anyone who approaches of the danger. Wait for firefighters to arrive – they’re trained to extricate you safely. Don’t walk under damaged structures or trees. Loosely-attached debris can break off and fall without warning.